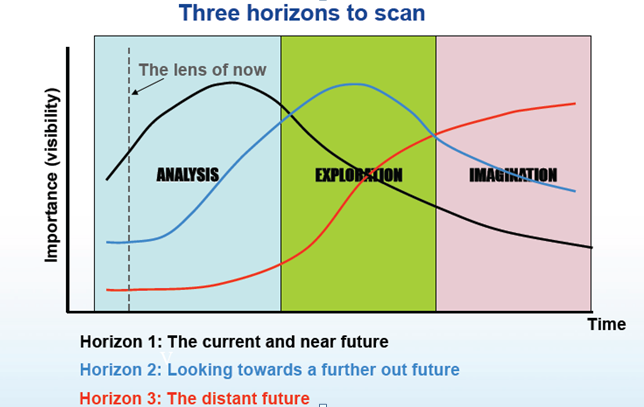 Thinking through the management of innovation have you ever considered the Three Horizons approach? Over a series of blogs I will explore and expand on this more extensively as it is often ‘touched upon’ but is worthy of exploring in a deeper way. It is likely through this approach business leaders can adopt an evolutionary perspective across the entire innovation business portfolio. If you are thinking through different horizons to approach innovation then the three horizon model has considerable merit to consider. It becomes clear fairly quickly in development that you need to invest across different innovative activities and these should be managed differently across time horizons for applying different resources as you search for eventual solutions. Also I think this three horizon model can become a useful tool for linking innovation to strategy. Horizon Three consists of nascent business ideas and opportunities that could be future growth engines But with uncertainty at an unprecedented level in today’s business environment even the best analysis to determine probable outcomes will leave many unknowns about these potential businesses. Horizon three innovations are the ones that will change the nature of your industry. The main innovation differences become more apparent. In general, H1 innovations tend to be incremental, while H3 are more often radical innovations. There are several key ideas that arise when using the three horizons model. The first is that you must have innovation efforts aimed at all three time horizons. The second issue is that horizon 2 is incredibly difficult to manage. H2 innovations seem very similar to your current products and services, and the overpowering temptation is to use the same metrics to assess their success. You have to figure out a way to ring fence H2 innovation efforts. The final point is that people often mistake the three horizons model for a planning tool – it isn’t. So in summary, it is a reasonably simple idea with Horizon 1 being the current business, Horizon 2 being a related business and Horizon 3 being a completely new business that could disrupt the existing business. I like the model because it frames that restlessness demanded from innovation by activity seeking out and trying new businesses in H 2 and H3 in different ways of risk as well as opportunity. My thanks to Tim Kastelle for pointing me towards the three horizon framework a fair time back and raising my interest in the first place. Nice article. Good to see the integration of the S-cash curve, value decay and Chain of Timely Ideas (CTi) in one place.